Journal of the House of Commons: Volume 85, 1830. Originally published by His Majesty's Stationery Office, London, [n.d.]. Report on Excise Duties Acts. Mercurii, 17 die Martii; Anno 11 Georgii IV ti Regis, 1830. Return of Law Suits in Wales, presented. No. 152. Congleton and Buxton Road Bill, passed. Whaddon and Nash Inclosure Bill, committed. Member added to a Committee. Petition against Chard Roads Bill. Petition against Breconshire Roads Bill. Petition in favour of Leeds and Selby Railway Bill. Petition for Leave for Little Bolton Improvement, reported. Petition against Limerick and Charleville Road Bill. Limerick and Charleville Road Bill, committed. Brunswick Square (Brighton) Improvement Bill, passed. New Chappel and Brighton Road Bill, passed. Petitions in favour of Broomielaw (Glasgow) Railway and Tunnel Bill. Forth and Clyde Junction Canal Road Bill, committed. Petitions against Renewal of East India Charter. Petitions for mitigating the severity of the Criminal Law. Petitions for revision of Laws relating to Vagrants. Petitions for repeal of Malt and Beer Duties. Petitions for repeal of Tax on Cider. Petition for inserting a Clause in the Indemnity Bill. Returns to be printed No. 153. Address respecting Law Suits in Wales. Smugglers Families Maintenance Bill, deferred. Petition against extension of Licenses in the Beer Trade. Petition against Reduction of Duties on Malt. Petition com. plaining of Surveyors of Assessed Taxes. Power to Committee on Northern Roads. Account of Corn Averages, presented. No. 154. Petition for abolishing practice of burning Hindoo Widows. The Lords have agreed to Horsham and Guildford Road Bill. The Lords have passed Lord Ellenborough's Divorce Bill. Return of Passengers by the Liverpool Packets, ordered. 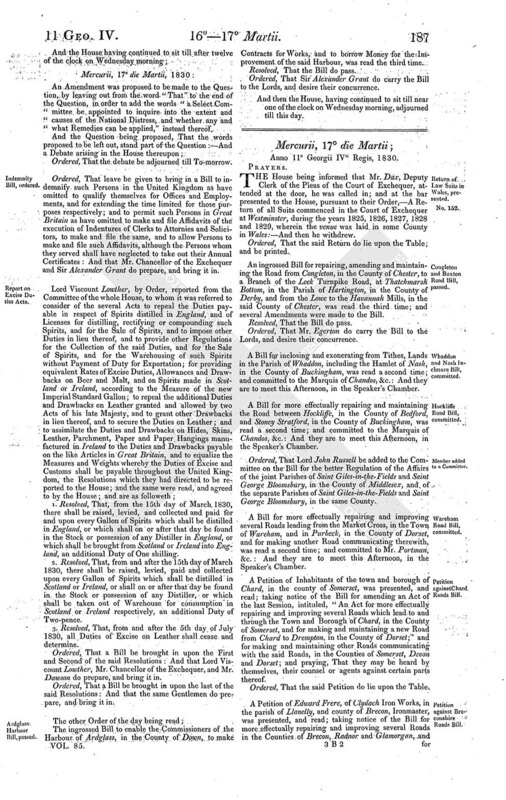 An Amendment was proposed to be made to the Question, by leaving out from the word "That" to the end of the Question, in order to add the words "a Select Committee be appointed to inquire into the extent and causes of the National Distress, and whether any and what Remedies can be applied," instead thereof. Ordered, That the debate be adjourned till To-morrow. Ordered, That leave be given to bring in a Bill to indemnify such Persons in the United Kingdom as have omitted to qualify themselves for Offices and Employments, and for extending the time limited for those purposes respectively; and to permit such Persons in Great Britain as have omitted to make and file Affidavits of the execution of Indentures of Clerks to Attornies and Solicitors, to make and file the same, and to allow Persons to make and file such Affidavits, although the Persons whom they served shall have neglected to take out their Annual Certificates: And that Mr. Chancellor of the Exchequer and Sir Alexander Grant do prepare, and bring it in. 1. Resolved, That, from the 15th day of March 1830, there shall be raised, levied, and collected and paid for and upon every Gallon of Spirits which shall be distilled in England, or which shall on or after that day be found in the Stock or possession of any Distiller in England, or which shall be brought from Scotland or Ireland into England, an additional Duty of One shilling. 2. Resolved, That, from and after the 15th day of March 1830, there shall be raised, levied, paid and collected upon every Gallon of Spirits which shall be distilled in Scotland or Ireland, or shall on or after that day be found in the Stock or possession of any Distiller, or which shall be taken out of Warehouse for consumption in Scotland or Ireland respectively, an additional Duty of Two-pence. 3. Resolved, That, from and after the 5th day of July 1830, all Duties of Excise on Leather shall cease and determine. Ordered, That a Bill be brought in upon the First and Second of the said Resolutions: And that Lord Viscount Lowther, Mr. Chancellor of the Exchequer, and Mr. Dawson do prepare, and bring it in. Ordered, That a Bill be brought in upon the last of the said Resolutions: And that the same Gentlemen do prepare, and bring it in. The ingrossed Bill to enable the Commissioners of the Harbour of Ardglass, in the County of Down, to make Contracts for Works, and to borrow Money for the Improvement of the said Harbour, was read the third time. Resolved, That the Bill do pass. Ordered, That Sir Alexander Grant do carry the Bill to the Lords, and desire their concurrence. And then the House, having continued to sit till near one of the clock on Wednesday morning, adjourned till this day. THE House being informed that Mr. Dax, Deputy Clerk of the Pleas of the Court of Exchequer, attended at the door, he was called in; and at the bar presented to the House, pursuant to their Order,-A Return of all Suits commenced in the Court of Exchequer at Westminster, during the years 1825, 1826, 1827, 1828 and 1829, wherein the venue was laid in some County in Wales:-And then he withdrew. Ordered, That the said Return do lie upon the Table; and be printed. An ingrossed Bill for repairing, amending and maintaining the Road from Congleton, in the County of Chester, to a Branch of the Leek Turnpike Road, at Thatchmarsh Bottom, in the Parish of Hartington, in the County of Derby, and from the Lowe to the Havannah Mills, in the said County of Chester, was read the third time; and several Amendments were made to the Bill. Ordered, That Mr. Egerton do carry the Bill to the Lords, and desire their concurrence. A Bill for inclosing and exonerating from Tithes, Lands in the Parish of Whaddon, including the Hamlet of Nash, in the County of Buckingham, was read a second time; and committed to the Marquis of Chandos, &c.: And they are to meet this Afternoon, in the Speaker's Chamber. A Bill for more effectually repairing and maintaining the Road between Hockliffe, in the County of Bedford, and Stoney Stratford, in the County of Buckingham, was read a second time; and committed to the Marquis of Chandos, &c.: And they are to meet this Afternoon, in the Speaker's Chamber. Ordered, That Lord John Russell be added to the Committee on the Bill for the better Regulation of the Affairs of the joint Parishes of Saint Giles-in-the-Fields and Saint George Bloomsbury, in the County of Middlesex, and of the separate Parishes of Saint Giles-in-the-Fields and Saint George Bloomsbury, in the same County. A Bill for more effectually repairing and improving several Roads leading from the Market Cross, in the Town of Wareham, and in Purbeck, in the County of Dorset, and for making another Road communicating therewith, was read a second time; and committed to Mr. Portman, &c.: And they are to meet this Afternoon, in the Speaker's Chamber. A Petition of Inhabitants of the town and borough of Chard, in the county of Somerset, was presented, and read; taking notice of the Bill for amending an Act of the last Session, intituled, "An Act for more effectually repairing and improving several Roads which lead to and through the Town and Borough of Chard, in the County of Somerset, and for making and maintaining a new Road from Chard to Drempton, in the County of Dorset;" and for making and maintaining other Roads communicating with the said Roads, in the Counties of Somerset, Devon and Dorset; and praying, That they may be heard by themselves, their counsel or agents against certain parts thereof. Ordered, That the said Petition do lie upon the Table. A Petition of Edward Frere, of Clydach Iron Works, in the parish of Llanelly, and county of Brecon, Ironmaster, was presented, and read; taking notice of the Bill for more effectually repairing and improving several Roads in the Counties of Brecon, Radnor and Glamorgan, and for making and maintaining several new Branches of Road to communicate therewith; and praying, That the same may not pass into a law. A Petition of Gentry, Merchants, Bankers, Traders and other Inhabitants of the town and liberties of Beverley, in the east riding of the county of York, was presented, and read; taking notice of the Bill for making a Railway from the Town of Leeds to the River Ouse, within the Parish of Selby, in the West Riding of the County of York; and praying, That the same may pass into a law. Lord Stanley reported from the Committee on the Petition of Trustees for executing the Act (so far as the same relates to the town of Little Bolton, in the county palatine of Lancaster), for inclosing, dividing and allotting a certain common or waste ground, called Bolton Moor, and other the commons and waste grounds within the township of Great Bolton, in the county palatine of Lancaster; and for widening, paving, lighting, watching, cleansing and regulating the streets, lanes, passages and places within the towns of Great Bolton and Little Bolton, and for supplying the said towns with water, and for providing fire-engines and firemen, and for removing and preventing nuisances, encroachments and annoyances, and for licensing and regulating hackney coaches and chairs, within the said towns, for leave to present a Petition; That they had examined the matter thereof; and the Report was brought up, and read. Ordered, That leave be given to present a Petition, as desired. A Petition of the said several persons was accordingly presented, and read; containing the same allegations as their former Petition; and praying, That leave may be given to bring in a Bill for more effectually cleansing, lighting, watching, regulating and improving the Town of Little Bolton, in the County Palatine of Lancaster. Ordered, That the said Petition be referred to a Committee:-And it is referred to Lord Stanley, &c.: And they are to meet To-morrow, in the Speaker's Chamber; and have Power to send for persons papers and records. A Petition of Thomas Flanagan, Gentleman, agent to certain Landholders along the road from Newcastle, in the county of Limerick, to the city of Limerick, was presented, and read; taking notice of the Bill for improving and repairing the Road leading from Newcastle, in the County of Limerick, to the City of Limerick, and from thence to Charleville, in the County of Cork; and praying, That the same may not pass into a law. A Bill for improving and repairing the Road leading from Newcastle, in the county of Limerick, to the City of Limerick, and from thence to Charleville, in the County of Cork, was read a second time; and committed to Mr. Spring Rice, &c.: And they are to meet this Afternoon, in the Speaker's Chamber. An ingrossed Bill for paving, lighting, watching, cleansing and otherwise improving Brunswick Square and Brunswick Terrace, and certain Streets and other Public Places upon certain Grounds, late part of a Farm called the Wick Farm, in the Parish of Hove, in the County of Sussex, was read the third time. Ordered, That Mr. Burrell do carry the Bill to the Lords, and desire their concurrence. An ingrossed Bill for more effectually repairing and maintaining the Road from New Chappel, in the County of Surrey, to Ditcheling Bost Hills, in the County of Sussex, and from thence to the Town of Brighthelmston, in the same County; and also for making and maintaining a Branch of Road from the Town of Ditcheling to Clayton, in the County of Sussex, was read the third time. A Bill for inclosing Lands in the Parish of Wistow, in the County of Huntingdon, and for extinguishing the Tithes in the said Parish, was read a second time; and committed to Mr. John Calvert, &c.: And they are to meet this Afternoon, in the Speaker's Chamber. A Petition of the Lord Provost, Magistrates and Common Council of the city of Glasgow;-of Magistrates and Council of the burgh of barony of Greenock, assembled in Council;-of the Directors of the Chamber of Commerce and Manufactures, established by royal charter in the city of Glasgow;-of the Provost, Magistrates and Town Council of the burgh of Airdrie, in Common Council assembled;-of Proprietors of Steam-boats navigating the River Clyde;-and, of Merchants, Manufacturers or Burgesses in Glasgow,-were presented, and read; taking notice of the Bill for making a Railway and Tunnel from the Broomielaw Harbour of Glasgow, to communicate with the Canals and Railways passing by, or terminating at, the higher Levels towards the North and Northeast of the said City of Glasgow; and praying, That the same may pass into a law. And the said Petitions were ordered to lie upon the Table. A Bill for making and maintaining a Road from the Cut of Junction of the Forth and Clyde Navigation with the Monkland Canal, to the Road leading from Port Dundas to the Garscube Road, in the County of Lanark, was read a second time; and committed to Mr. Downie, &c.: And they are to meet this Afternoon, in the Speaker's Chamber. A Petition of the High Bailiff and Inhabitants of the borough of Kidderminster;-of Merchants, Manufacturers and other Inhabitants of the borough of Wigan, and of the immediate neighbourhood thereof;-and, of the Provost, Magistrates, Town Council and Deacons of Incorporations of the royal burgh of Lanark,-were presented, and read; praying, That at the earliest period allowed by law, such measures may be adopted as shall secure to all His Majesty's subjects in the United Kingdom a Free Trade to all the countries situated to the eastward of the Cape of Good Hope, and the liberty of proceeding to and residing in these countries, under such regulations as to the House may seem proper and consistent with the good government, tranquillity and safety of the British Possessions in the East Indies. And the said Petitions were ordered to be referred to the Select Committee on East India Company's Affairs. A Petition of Inhabitants of Colchester and its vicinity;-of the town and county of Poole;-of Plymouth and its vicinity;-of the town and neighbourhood of Kingston-upon-Hull;-of the Borough Bailiff and other Inhabitants of the Borough of Malton;-and, of Magistrates, Clergy, Merchants, Bankers, and other Inhabitants of the city of Norwich and its environs,-were presented, and read; setting forth, That the Petitioners wish to call the attention of the House to the existing Penal Code of this country, which has long been distinguished for its severity, and affixes the punishment of death in a marked degree to crimes against property; the Petitioners wish especially to call the attention of the House to the infliction of the punishment of death for forgery; and praying the House to take this important subject under their deliberate consideration, and to adopt such measures as will promote the great interests of society, as well as the honour and welfare of this enlightened nation. And the said Petitions were ordered to lie upon the Table; and, except the first, to be printed. A Petition of the High Sheriff and the Justices of the Peace of the county of Bedford, and of the Grand Jury of the said county, assembled at the Assizes, held at Bedford, for the county of Bedford, on the 6th day of March 1830;-and, of the High Sheriff and the Grand Jury for the county of Stafford,-were presented, and read; praying the House to revise the Laws now in force with respect to Paupers of Ireland, Scotland, Jersey and Guernsey, resident in England, and to leave such paupers to the ordinary operation of the laws of settlement, or to assimilate the treatment of vagrants from those counties to that exercised towards English vagrants, or if it should be thought inconsistent with a benevolent policy to make such a provision, until there shall be a system of Poor Laws in those places similar to that now in force in England, that the expense incurred by the removal or passing of such paupers through the English counties, be not borne exclusively by the inhabitants of those counties, but that they may be reimbursed from the general Revenues of the United Kingdom, or by those portions of the Empire, to which such paupers or vagrants do respectively belong. And the said Petitions were ordered to be referred to the Select Committee on the state of the Poor in Ireland. 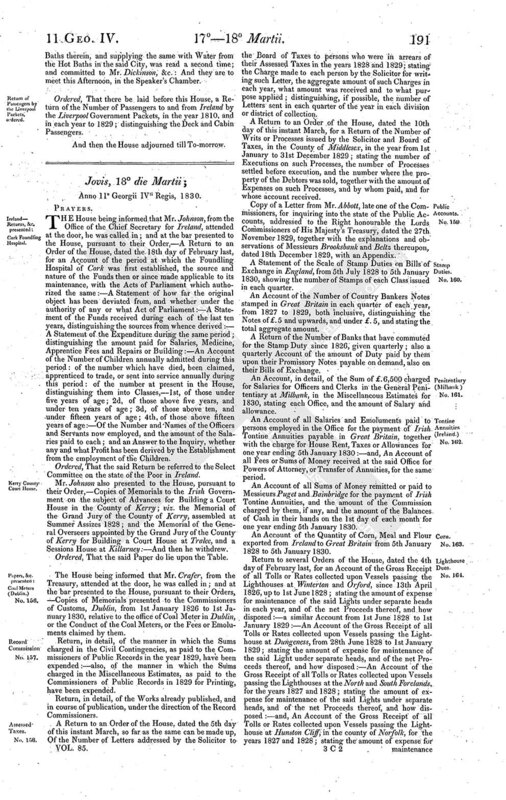 Ordered, That the Petition of Inhabitant Householders assessed to the Poor Rates of and within the parish of the Blessed Virgin Mary, in the Borough of Devizes, in the county of Wilts, for assessing to the Poor Rates houses let at rents not exceeding 15 l. per annum, which was yesterday presented to the House, be printed. A Petition of Gentry, Clergy, Yeomanry, Tenantry, Tradesmen and Labourers of the several parishes of Baginton, Bubbenhall, Ryton and Stretton-on-Dunsmore, Princethorpe, Woolston, Brandon and Bretford, in the county of Warwick;-of Inhabitants of Thornham and Deptling, in the county of Kent;-of Saint Ebbe, in the city of Oxford;-and, of the Hundred of Launditch, in the county of Norfolk,-were presented, and read; praying for a total repeal of the Duties on Malt and Beer. A Petition of the Gentry, Clergy, Merchants, Bankers, Ship-owners, Agriculturists and others of Kingston-uponHull and neighbourhood;-of the Lords, Deputy Lords, Bailiff and Jurats of the level of Romney Marsh, in the county of Kent;-and, of Gentry, Clergy, Yeomanry, Tenantry, Tradesmen and Inhabitants of the market-town of Stockbridge and its neighbourhood, in the county of Hants,-were presented, and read; praying, That the House will be pleased instantly to inquire into the causes of the present universal distress, and grant such relief as its importance demands. And the said Petitions were ordered to lie upon the Table; and to be printed. A Petition of the Inhabitants of Chard and its vicinity;-and, of Ilminster and its vicinity,-were presented, and read; praying, That the House will forthwith take such measures as to them may seem meet for the repeal of the Tax on Cider. Ordered, That there be laid before this House, an Account of the amount of Duty on Coals received in Ireland during each of the last ten years. Ordered, That there be laid before this House, an Account of the number of Gallons of Spirits which paid Duty in Ireland during each of the last ten years. A Petition of Inhabitants of the parish of Sheepshead, in the county of Leicester;-of Inhabitants, Ironmasters, Coalmasters, Nailfactors, Manufacturers, Retail Traders and Shopkeepers residing and carrying on business in the parish and neighbourhood of West Bromwich, in the county of Stafford;-of Merchants, Manufacturers and other Inhabitants of the parish of Wednesbury, in the county of Stafford and its neighbourhood;-of Shopkeepers, Workmen and Inhabitants of the town of Wednesbury and its neighbourhood;-of Inhabitants of the parish of Kingswinford, in the county of Stafford;-of King Stanly and its vicinity, in the county of Gloucester;-of Workmen and Labourers of the town of Burslem, in the Staffordshire Potteries and its vicinity;-of Magistrates, Ironmasters, Coalmasters, Nailmasters and Manufacturers residing and carrying on business in the town and neighbourhood of Dudley, in the counties of Worcester and Stafford;-of Workmen and Labourers of the town and parish of Dudley, in the county of Worcester;-of Nailmasters, Manufacturers, Retail Tradesmen and Shopkeepers, Workmen and Labourers in the town and neighbourhood of Hales Owen, in the counties of Salop and Worcester;-of Magistrates acting in and for the county of Stafford;-of Members of the Society of Mechanics who have improved or invented the machinery used in the hosiery and lace manufactures, in behalf of themselves and others employed in the said manufactures in the town and neighbourhood of Nottingham;-and, of John Livesey, Chairman of a meeting of the Inhabitants of the townships of Great and Little Bolton, in the county of Lancaster and boroughreeve of Little Bolton,-were presented, and read; complaining of the practice of masters paying the wages of their workmen in goods instead of money; and praying the House to adopt such measures for the speedy and effectual suppression of this injurious system as to them shall seem meet. And the said Petitions were ordered to lie upon the Table; and that the two last be printed. A Petition of John Jepson, of the town of Nottingham, was presented, and read; setting forth, That the Petitioner has been for many years a Licensed Victualler in the town of Nottingham, and that he has been convicted in the penalty of 20l. for game left with him in January last; stating the particulars of his case; and praying, That the House would be pleased to take the same into their serious consideration, and afford him that remedy which they may see fit, and at the same time to revise those laws by which an honest industrious man is placed in peril from the unprincipled, and his ruin effected, though perfectly innocent of crime. A Petition of Walter Willett Harries, of Milford, South Wales, was presented, and read; setting forth, That in January 1821, the Petitioner was articled to Mr. Thomas Peregrine, of the town of Milford, Notary Public, and duly served the required period of seven years, to enable him to act in the same profession; but Mr. Peregrine having been admitted a Notary forty years ago, long before the passing of the Act requiring the registry of indentures in the proper Court, within three months from the execution of the same, both he and the Petitioner were entirely ignorant that such an Act had passed the House, and consequently the Petitioner omitted to register his indentures; and praying, That the House will take his case into their consideration, and relieve him by permitting the insertion of a clause in the Annual Indemnity Act. Ordered, That the Returns of Suits commenced in the Courts of King's Bench and Common Pleas at Westminster, wherein the venue was laid in Wales. which were yesterday presented to the House, be printed. Ordered, That the said Order be discharged. Resolved, That an humble Address be presented to His Majesty, that He will be graciously pleased to give directions, that there be laid before this House, a Return of all Suits in the several Common Law Courts of Westminster, wherein the venue was laid in Wales, and which were sent down for Trial at Shrewsbury or Hereford, within the last ten years. Ordered, That the said Address be presented to His Majesty, by such Members of this House as are of His Majesty's most honourable Privy Council. Ordered, That the Bill be read the third time upon Friday next. A Petition of Licensed Victuallers resident within the borough of Cirencester, in the county of Gloucester, was presented, and read; setting forth, That the Petitioners are loyal subjects of this realm, cheerfully submitting to the laws, and contributing to the support of the State, and exemplary for correct and orderly conduct in their business; that the Petitioners cannot view with indifference the measure at present contemplated by Parliament to extend the license to sell beer to private individuals and shops, as the same will, in the apprehension of the Petitioners, be exceedingly injurious to them, as well as to the body of Victuallers at large, and be attended with no advantage to the revenue or to the public; and praying, That the House will not allow the above proposed measure to pass into a law. Ordered, That the said Petition be referred to the Select Committee on the Sale of Beer. A Petition of James Rice Williams, of Lee, in the county of Kent, Esquire, was presented, and read; setting forth, That it is now some time since the lower classes, of all descriptions, of both sexes, and of all ages in that neighbourhood, in London as well as throughout England and Wales, have adopted the dreadful custom of drinking spirits to such a degree as to promote the greatest excess of drunkenness, and therefore criminality as well as pauperism of the country; as inquiry will satisfy the House far better than the Petitioner can do, what has been that excess, he will not presume here to speak to its amount, but he will boldly venture to declare, that unless an essential remedy be found for these tremendous evils, all other attempts at improvement will be vain; nothing indeed can appear to him to be likely to prove more fruitless than a taking off the duty from malt liquors, if these evils are suffered to remain, since a complete reduction would not lessen the attachment now formed to ardent spirits; and praying the House to take these matters into serious consideration, and refer them to any Committee already appointed, or to be appointed, to make inquiry into what he now takes the liberty to submit to its consideration. A Petition of Giles Hoad, of Fareham, in the county of Southampton, Inn Keeper, was presented, and read; complaining of the powers given to Surveyors of Assessed Taxes; stating the particulars of his case, and praying the House to take the same into consideration, and to adopt such measures as will in future protect the Petitioner and all others in the same line of business from the consequences of charges made by the caprice of Surveyors at a time of such unparalleled distress. 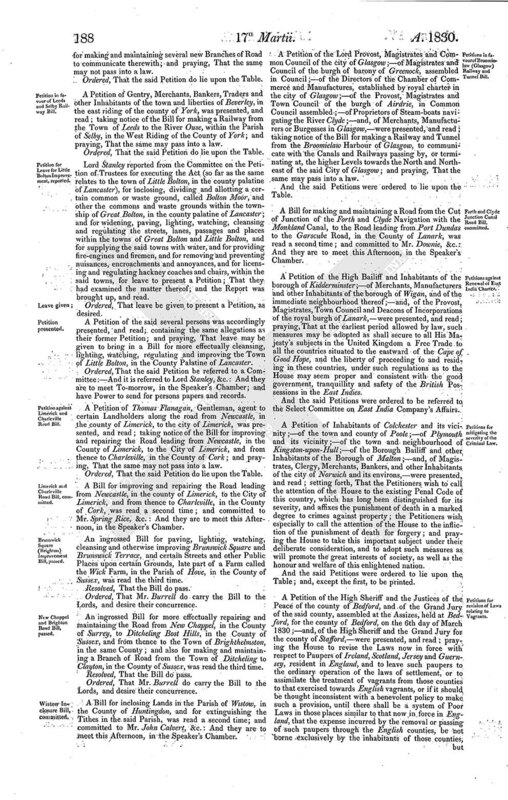 A Petition of Brewers of Edinburgh and its vicinity, was presented, and read; setting forth, That since the year 1823, the consumption of malt liquors has greatly fallen off in Scotland; that the reasons which have generally been assigned to account for the diminished use of malt liquors do not apply to that part of the United Kingdom; that the sale of malt liquors in Scotland has been and is perfectly free, so that the restrictive system of licenses does not operate there; that the quality of Scotch ale, so far from having become inferior, has within these few years past been greatly improved; that the real cause of the diminished consumption of malt liquors in Scotland is the low rate of duty now charged on whisky, and the consequent inducement presented to the people to consume it in preference to malt liquors, the duties on which have not been abated; and praying the House to raise the duties payable on whisky in Scotland, or to grant an abatement of the duties on beer in proportion to the reduction of duty on whisky, if such shall be continued, or to do otherwise, as to the House may seem meet. Ordered, That the said Petition do lie upon the Table; and be printed. Ordered, That there be laid before this House, an Account of all Sums paid into the Stamp Office for Duty on Insurance from Fire in London and the Country, for the quarters ending severally on 25th March, 24th June, 29th September, and 25th December 1829; distinguishing the amount of the Allowance made to each Office for collecting the same, severally, of £.4 and £.5 per cent., and by what Offices or Persons such Sums have been paid, together with the Dates of such Payments. Ordered, That there be laid before this House, an Account of the Sums received by the Commissioners of Stamps during the last six years, ending 5th January, for Stamps on Marine Policies; distinguishing what Sums were received on Policies effected in London. Ordered, That the Select Committee on Northern Roads have power to report their Observations, together with the Minutes of the Evidence taken before them, to the House. Mr. Courtenay presented to the House, pursuant to their Order,-An Account of the Average Prices of Corn per quarter in England and Wales for ten years, ending December 1829, in periods of five years, and showing the price of each year. Ordered, That the said Account do lie upon the Table; and be printed. A Petition of Inhabitants of Alcester and its vicinity, was presented, and read; praying the House to adopt such further measures as may effectually secure the abolition of the practice in India of burning widows on the funeral piles of their husbands. Resolved, That this House will, upon Monday next, resolve itself into the said Committee. The Lords have passed a Bill, intituled, An Act to dissolve the Marriage of the Right honourable Edward Baron Ellenborough with the Right honourable Jane Elizabeth Baroness Ellenborough his now wife, and to enable him to marry again, and for other purposes therein mentioned, to which the Lords desire the concurrence of this House: -And then the Messengers withdrew. 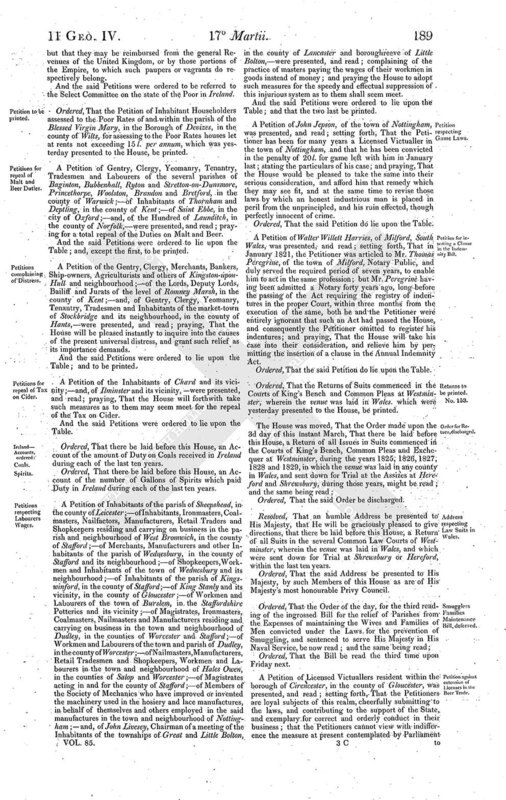 Ordered, That the Order of the day, for the second reading of the Bill to repeal so much of an Act passed in Ireland, in the fourth year of the reign of King George the First, for the better regulating the Town of Galway, and for strengthening the Protestant interest therein, as limits the Franchise created by the said Act to Protestants only, be now read; and the same being read:-The Bill was read a second time; and committed to a Committee of the whole House for To-morrow. Ordered, That the Bill be read the third time Tomorrow. Resolved, That this House will, upon Friday next, resolve itself into the said Committee. 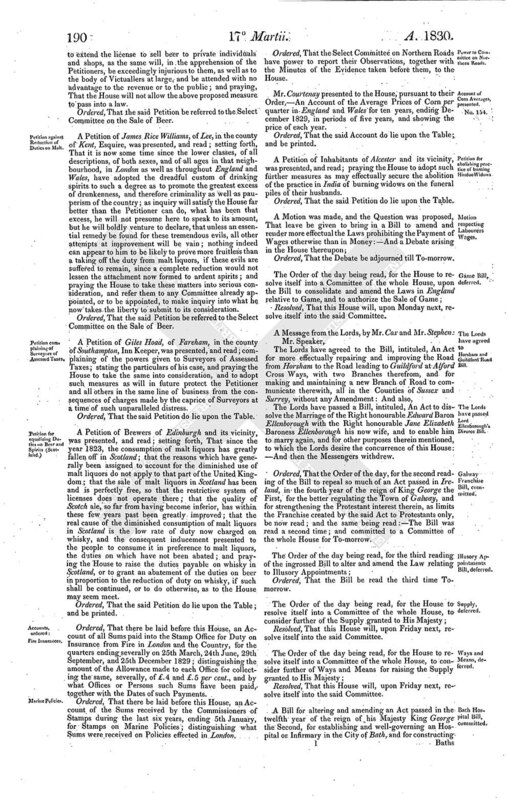 A Bill for altering and amending an Act passed in the twelfth year of the reign of his Majesty King George the Second, for establishing and well-governing an Hospital or Infirmary in the City of Bath, and for constructing Baths therein, and supplying the same with Water from the Hot Baths in the said City, was read a second time; and committed to Mr. Dickinson, &c.: And they are to meet this Afternoon, in the Speaker's Chamber. Ordered, That there be laid before this House, a Return of the Number of Passengers to and from Ireland by the Liverpool Government Packets, in the year 1810, and in each year to 1829; distinguishing the Deck and Cabin Passengers. And then the House adjourned till To-morrow.